These two lines are how “This Here Defeat” starts off, the 5th and forthcoming album of Scott Matthew, who can sing like no one else about how it is to long for love and feel it slip away (he has sung and still sings about other sides of life too, but not as intensely and poignantly as he does about love, and quite naturally so). More precisely, his new album begins with the sound of strings and an electric guitar. The former are no surprise to those familiar with Scott’s previous work. But, an electric guitar? I couldn’t remember hearing that in one of his songs before. This indeed marks a greater change for him: to include the sound of an electric guitar on “This Here Defeat” – at times ominous, then cutting and again appeasing, accompanied by a ponderous drum beat, the soft and clear, bell sound of a Fender Rhodes, … And if you listen very closely, you can even hear electronic sounds and effects on one of Scott’s records for the first time ever, although subtly interwoven. 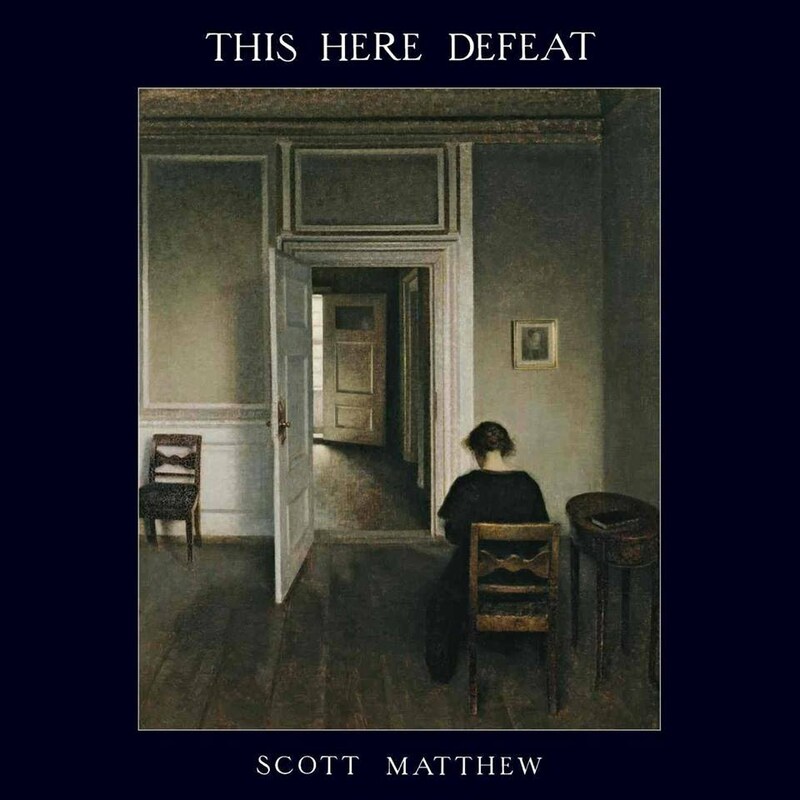 Scott Matthew is a musician who has chosen early on to creatively limit the tonal aesthetics of his music in favour of the grandness found in minimalism, and not in the spectacular. Cello, piano, ukulele and acoustic guitar have always had their place in his songs right next to Scott’s voice, rarely more or anything else. His lyrics and voice, too, have always seemed to have found their distinct subject and unmistakable tonality: It is a lamentation. But not bitter, nor whining – and never hopeless. There is and always has been a feeling of warmth and an indelible longing; a protest against what some call fate; a certainty that, however lonely we may be in our individual existences, we all experience and go through the same solitude together: “Come on the disaffected, believe what we need matters, I’ve had a premonition, a place where we can grieve”, Scott sings on “Skyline”, one of the centrepieces of this new album. And when all hope seems lost, we can still rely on the tongue-in-cheek knowledge of how absurd our actions, thoughts or feelings can be to kindle it anew. Hope may not always be the best friend one can have in life, but at least it is always there when it is needed most. And a sigh from Scott in its best expression is a shout of hope to kick off the fresh start we all make time after time: “Here we go again …”. This was all only possible now though with a little earthly help flown to New York, the hometown of the Australian singer. Scott had been writing songs sporadically over the past two years and had already recorded demo versions. But he was not entirely satisfied with them – he was still looking for the right instrumentation and arrangements. So he asked his guitarist from Germany, Jürgen Stark, to visit him. He and Scott had been friends for years and had also played together on stage. They locked themselves in Scott’s apartment in Brooklyn for two weeks to work on the songs – some alone, some together. After that, it was clear, this album would be made and Jürgen Stark was going to be the producer: Scott has found in Jürgen a true musical collaborator. The album was then recorded within six days together with Scott’s longtime musical companions, Eugene Lemcio (piano, bass) and Sam Taylor (cello) in Lisbon, the city, that Scott has been in love with ever since he worked there together with Rodrigo Leão (co-founder of Madredeus). “This album is a nice diversion of what I’ve done before”, Scott tells us, “without being something completely new. It’s more of an extension of what I’ve done before – but it’s different.” The first tracks may be darker and, at the same time, more solumn than Scott’s previous work, more unabated and elegiacal. Until the title track comes, almost as suddenly as a rainbow appearing in the sky – a classic pop song, soft with feather-light instrumentation, and lyrics that are sad and humourous at once: “This Here Defeat” is a song about someone who turns out after all is said and done to be quite a lousy ex-lover, to whom the narrator does not even feel like dedicating a song. A perfectly paradoxical song indeed, that, according to the lyrics, should not even exist. A goodbye and good riddance from the songwriter. Not at all a defeat, as the title seemingly admits, but a triumph of the betrayed and estranged.